These hand-dyed twisted silk bracelets have been on my my Etsy favourites list for a while. They are the handiwork of the delightful Danni, who not only has a stellar blog but also makes beautiful scarves and has now delved into bracelets, both of which you can purchase in her shop. Hopefully I will be making a whole "arm party" out of a stack of these bracelets before long. I actually got to briefly meet this lovely lady while in Toronto for LG Fashion Week, and she is just as gorgeous and sweet in person. I was excited to hear that she's already dyed the custom made silk scarf that I will be giving away to a lucky reader in a couple of weeks, someone is going to be seriously happy, trust me - because her work is fantastic. I hope I've whet your appetites a little for the last (and most definitely not least) giveaway of the five weeks of favourites - make sure to take a look at Danni's blog and shop, you will not be disappointed. Aren't they just amazing?! She does great work. I hope you enjoyed your time in Toronto! Aren't they just GORGEOUS? I want one so badly - have to start saving my pennies and support the lovely Danielle. Great feature! 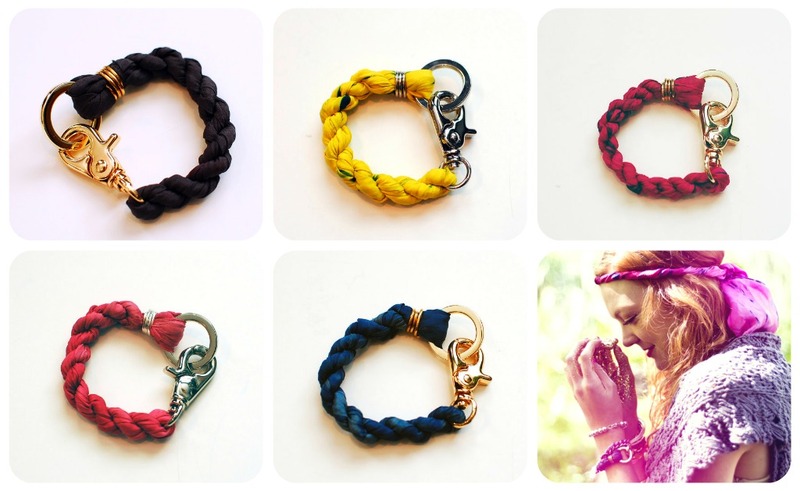 Those are SUCH gorgeous bracelets! These bracelets are so cute such a great idea. I really love them. I bet the scarf is going to beautiful.